Utilizing talented and trained vocalists, The Victorian Carolers Quartet are Toronto's premium Caroler group, performing popular & sacred carols, incorporating 4 part harmonies into some of the most well- known secular songs of the season. This, in conjunction with their very charming period costumes make The Victorian Carolers Quartet a visual delight as well as an auditory one. 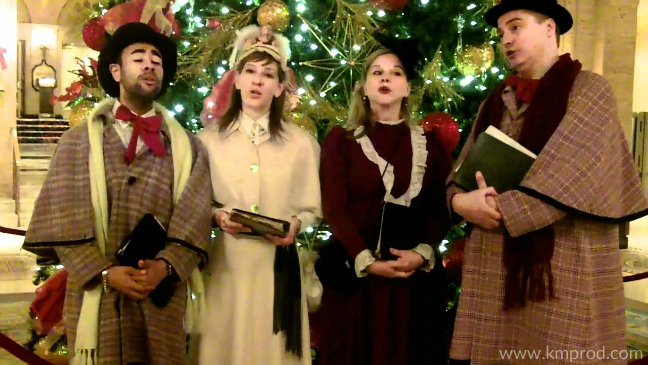 The Victorian Carolers are part of that very special time of the year and enhance any holiday seasonal corporate or social event. For more information, fees & booking the Victorian Carolers Quartet, contact us. 2 Queen St East, Brookfield Office Properties. They were terrific - very personable and engaging. They sang much better than we did but everyone had fun. The Carolers were amazing and brought a big smile to a lot of our residents faces. Thank you K&M Productions! We had a great party and your Victorian Carolers were a wonderful addition to our festivities. I can’t say enough about them. They sang beautifully and were really great to work with. They did a fantastic job of getting everyone to "sing for their supper"! Please extend my sincere thanks and appreciation for a job well done!! I would love to hire them again, so I’ll be in touch. Our clients loved them! They sounded great and everyone thought they were a nice addition to the party. They are fantastic, consistently excellent and we book them every year. Our residents and staff love them.